Fes, Morocco is famous for their medina, a massive community of small cobblestone alleys loaded with riads, Moroccan lodging, as well as souks, which are Arab marketplace vendors. It is home to the oldest Medina in the whole wide world and is a UNESCO World Heritage Site. Fes is also known to be the spiritual city of Morocco. Staying in Fes: Inside the Medina or Outside the Medina? We stayed in two parts of the city: in the new city and in the medina. While staying in the new city, we checked into the Jnan Palace Marriott Fes. This hotel had tip-top security, gorgeous décor, probably the best fitness center in the entire city, their own modern Hammam spa, and three restaurants on site. The rooms celebrated Moroccan décor in a modern way and our balcony overlooked their luxurious pool. We landed an upgrade to one of the largest suites and it made us never want to leave. The Ambassador Suite featured a modern fireplace, bar area, boardroom, and the coolest shower/bath set up we’ve ever seen, you could fill the shower stall full of water and make a mini hot tub! We dined at their traditional Moroccan restaurant where a four-piece band played unique instruments from Morocco and serenaded us while we ate tagine, seven-vegetable couscous from the Fes region, and tried a Casablanca Beer, which was quite good! Many restaurants do not serve alcohol, so your hotel is the best place to eat if you want a beer or a bottle of Moroccan wine with your meal. The Marriott also features an Italian restaurant, which is terrific if you’ve been traveling the country for days and want to eat something non-Moroccan. They also offered large breakfast buffet to start your mornings with fresh juices and a mix of western and Moroccan traditional breakfast delicacies. For our last night, we decided to stay inside the medina in a riad. Think of a riad as a bed and breakfast in a small palace with a large courtyard. While transferring our lodging over to the Riad Laaroussa, we first called them in order to have someone meet us outside of the medina. Cars are not allowed (nor would they fit) in the medina so the riad meets you with a guide and a wheelbarrow-like cart in order to transport your luggage. They will then guide you through the unmarked, winding alleys of the medina to the door of your riad. We were greeted with traditional Moroccan tea and cookies in their awe-inspiring courtyard and explored their expansive rooftop and posh pool area. It truly feels like you are transported to a place of serenity when in reality a loud, busy medina is just on the other side of its walls. Riads prepare meals for their guests and some offer alcohol. The riad also had a spa, but sadly, it was fully booked when we arrived. Tip: be sure to book your spa times for riad’s prior to arriving, as they’re small and have limited appointments available. You can hire a guide to bring you on a tour of Fes, including the medina. Certified tour guides can be booked with the help of your hotel or riad. Our guide was instrumental when it came to leading us through the medina. He showed us bakeries, tanneries where leather is made, and various shops. However, be very wary of your guide. Even though this was a state-certified tour guide who supposedly didn’t make commission, we found him bringing us to expensive, touristy vendors and he would become annoyed and impatient when we didn’t buy anything. It’s a catch 22 because there is NO WAY we would have been able to initially navigate the medina without him, but we became annoyed with his sales pressure. We recommend getting a guide, but don’t fall trap into paying more than you should for items. In the future, if we go back we’d be sure to find a top food tour, cooking class, or history guide that’s been specifically reviewed heavily on TripAdvisor and other travel sites instead of getting assigned a random guide. We did a lot of shopping in Fes and were a bit a disappointed that we didn’t save more shopping for Marrakech as the medina in Marrakech offered more modern styles than Fes had. When shopping in the medina, no prices are listed and it is the most extreme haggling we have ever encountered. The first price quoted was often FOUR TIMES higher than the final price resulted. Don’t be afraid to walk away. Our best piece of advice is to read this post on how to get the best deal on Moroccan Souvenirs. We recommend using a tour guide on the first day of your visit to the medina. This will help you to safely navigate and become accustomed to the medina. The second day, with the help of the Riad Laaroussa, we obtained a paper map of the medina. Paired with the GPS location services of our offline Google Map (download this before you go!) we were able to wander around a small part of the medina on our own. Be really cautious using your cell phone in the medina, you don’t want it to get snatched. We usually hopped into a vendor stall, checked our GPS location compared to the paper map, then secured our cell phone in our lockable backpack before continuing our journey. When exploring the Fes medina on our own, we were able to find souvenirs wayyyy cheaper than when we were with our guide and stopped into Café Clock for lunch. This restaurant’s rooftop has a great view of a nearby mosque and you can even order a camel burger, if you’re adventurous enough to try it (spoiler alert: it was actually quite good!). Also, be sure to order the mint lemonade. One of the best things we tasted all trip, and we’ve made our own version multiple times as it’s a perfect drink for the Texas summer! Get the recipe here. While on a tour with our guide, we stopped at the golden gates of the King’s Royal Palace. This was the palace that the King of Morocco would reside in while visiting Fes. We were not able to enter the Palace as it is closed to the public, but the gigantic golden doors made for some great photos. After visiting the golden gates, we took a short drive to travel to a gorgeous lookout spot to get the best view of the city. It is free to access this lookout point. It is located in Jnan El Ouard, next to a hilltop cemetery. This gives you a good view of the medina and the Merenid Tombs, ruins from the 14 centuries. Our guide also took us to the Fes Mosaic School, which was a very fun experience. We saw how pottery and mosaics were made and Karen even took a “spin” on trying to throw pottery on the foot-powered pottery wheel (as you can imagine, it’s not easy)! The items for sales inside were priced much higher than what you can get in the medina, but we thought making a purchase here was the equivalent of buying a tour ticket and didn’t mind the upcharge. From Fes we decided to drive to Marrakech. We REALLY wanted to stop in the nearby town on Meknes where you can find a few Moroccan vineyards, but we unknowingly scheduled that day of travel on Morocco’s Labor Day. Travel tip: also check the country’s holiday calendar prior to planning your trip! We stopped in Casablanca for lunch on the way to Marrakech. Contrary to what most people think, Casablanca isn’t the best city to visit in Morocco as it’s more of an industrial port city now. 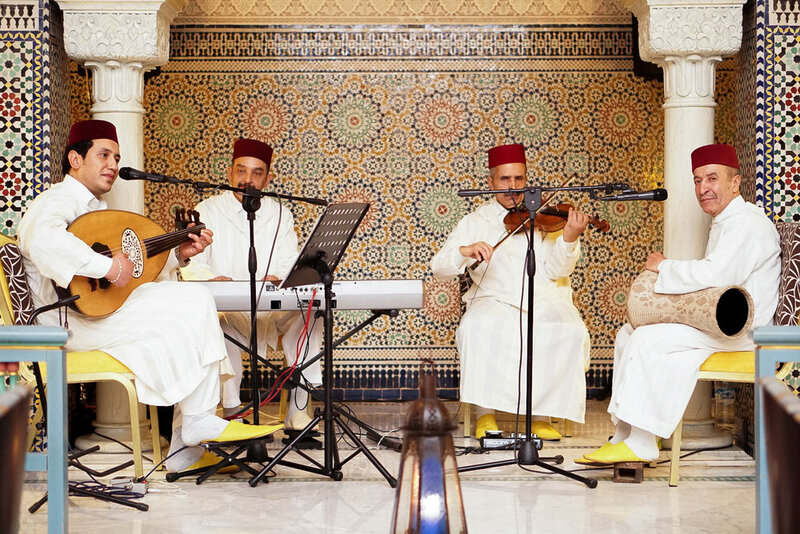 We’d recommend skipping Casablanca alltogether to spend more valuable time in Fes or other Moroccan cities. We hope this guide makes it easier for you to plan your travels to Fes Morocco and navigate the historic medina!